There is a general sense of panic across the country raised by the recent spurt in crisis ranging from extortion to abduction to killing, either for ransom or to extract political retribution or because of business grudge. In port city Narayanganj, on April 27, seven persons including panel mayor Nazrul Islam and his four aides and senior lawyer Chandan Sarker and his driver were kidnapped in a broad daylight. Four days later, the corpses of the victims, including those of Nazrul and Chandan, were found floating in the Shitalakkhya River and another was found the following day. Abu Bakar Siddique, husband of eminent environmental lawyer and chief executive of Bangladesh Environmental Lawyers Association (BELA) Syeda Rizwana Hasan, was abducted in broad daylight by a gang of armed miscreants in April 16, 2014, albeit he was released 33 hours after his abduction. 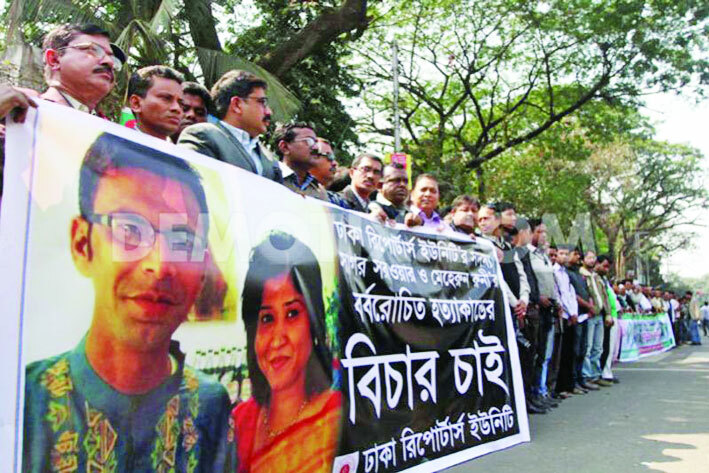 Ilias Ali, erstwhile lawmaker and organizing secretary of BNP’s Sylhet Division and his driver Ansar Ali went missing from Banani in the capital midnight past April 17, 2012. After two year of his disappearance, security agencies could not come up with any clue. Earlier, BNP chief Khaleda Zia alleged a government agency had picked up Ilias from his car. Chowdury Alam, 56 no ward commissioner of Dhaka City Corporation, a BNP leader was disappeared in June 25, 2010 from Farmgate, an important place of Dhaka city. The victim family suspected government agencies for his kidnapping. Two students of Kustia Islami University, Al Muqaddas and Waliullah, leaders of Bangladesh Islami Chatra Shibir have been missing since 4 February, 2013. These two students were kidnapped in the name of law enforcement agency from the way of going to Kustia from Dhaka. Limon Hossain, a juvenile HSC examinee of Kathalia PGS Polytechnic College, was returning home with grazing cattle, was shot and maimed by the Rapid Action Battalion (RAB) in 2011. These are some burning cases mentioned here. There are many available episodes of abduction, disappearance, murder and lynching occurring in Bangladesh which will make a gargantuan list that is not purpose of this writing. Every day, many people are going missing or are being killed in extra-judicial killing by law implementer agencies. There is no day passing without any news of kidnapping, murder, crossfire and disappearance. The number of disappearance, murder, crossfire and trafficking reached a frightening rate. Human right organizations including national and international are expressing their grave concerns over these violation of human rights. All quarters of people including businessman, political leaders, students, teachers, professionals, women and children are the victim of these heartless activities. It is alleged that the most of the fatalities belong to the opposition party. In the most of the cases, families of the victims point out their figure to the law enforcement agencies. Latest incident of 7 murders in Narayanganj shocked the conscience of the people enormously, though such events grasped the country previously by carnage the opposition parties’ supporters. Victims’ family alleged the elite force Rapid Action Battalion (RAB) assassinated them in exchange of money. People are not only unsecured in out of their home but also in their beds. Journalist couples Shagor-Runi and Ekushey award winner Aftab Ahmed were put to death in their beds. It is the function of government machineries to make certain citizen’s safety but state apparatuses have failed to make sure it. In many cases, it is found that law enforcement agencies involved in such scandalous activities. Abduction and disappearance have become integral part of the daily life of Bangladeshis. It is noted previous that green activist and Ramon Magsaysay award winner Syeda Rizwana’ spouse Abu Bakar Siddique was kidnapped in broad daylight and though he was freed unscathed 33 hours later, but it is a exceptional case that victim found safe and unscathed. Most of the cases found victims’ dead bodies or nothing. Unfortunates’ families do not know whether their beloved persons are alive or not or what happened in their fates. These days the people are getting fatigued of the news that their fellow citizens are being abducted or involuntarily disappeared from different parts of the country. In many instances their bodies are subsequently dumped and discovered on roads, pavements, drains, rivers, swamps and lakes. In other cases, they remain disappeared while their mothers, wives, sisters and children wait for their return. In a number of instances the families of victims have pointed fingers at the members of law enforcement agencies, including the Rapid Action Battalion. In a few cases, the aggrieved families even named senior officials of the agency. From last few years, incidents of kidnappings and missing are escalating tremendously. According to rights body Ain O Shalis Kendro’s (ASK) report, 268 people were abducted from 2010 to March of 2014. Among them 43 dead bodies were recovered, 24 came back and no information about 187. The Bangla daily the Naya Diganta published a report over abduction and human trafficking in April 20, 2014 where the report showed that the last 4 years, 3391 abduction cases were filed across the country. The yearly figure is presented below. According to a report of the Daily Star, an English daily (24-04-14) 332 people have been abducted between January 2013 and March 2014. Of them, 64 are students, 210 fishermen and the rest are from other professions including business, farming and worker. However, number of abduction may vary in the different findings conducted by different quarters, but all reports indicate the increased rate of kidnapping which is highly disquieting. Over time, there was a discernable rise in the number of extra judicial killings (EJK). The national rights bodies expressed their severe concern over the killings. Human Rights Watch and Amnesty International joined them and raised red flag as the figures of those slain extra judicially registered a steep rise. Even during the Universal Period Review at the Human Rights Council in Geneva, the Foreign Minister of the newly elected government had to make a public promise of zero tolerance of such homicides. In spite of such a public pledge EJKs continued unabated. But as public mood swung against the practice, those involved in the exercise changed their tactic. No longer were they prepared to dispose of the bodies of their victims, often with bullet wounds and gory torment, those were made to disappear. Every government either Awami league or BNP using the state machineries to quell the opposition defying the fundamental and human rights enshrined in the constitution, the supreme law of the land. The both party accept the paths of suppressing their archival through disappearance, crossfire, murder, and putting in prison to protect the throne of power. The ruling party in Bangladesh has left no stone unturned to perish the opposition since 1971. The independent political analysts said, when tyranny representative less government becomes accessibly dependent on the state apparatuses to stifle the citizens and gives the license of extra judicial killing and forced disappearance of opposition party’s workers to the law enforcers, and then they become desperate to commit any gruesome crimes such as abduction and ghastly butchery in exchange of money. The recent event of Naraynganj is the burning evidence where it was alleged by the victim’s family that some RAB-11 men killed 7 persons in exchange for Tk 6 crore from Awami League leader Shamim Osman, Nur Hossain and a few others. When security agencies who protect the citizens’ life involved in heinous activities against the people, consequently, the state can’t ensure the security to its citizens. As a result, all sorts of monstrous activities including extra judicial killings, disappearance, murder, torture massively spread out in the society. Time has come for political parties to fathom that it is not possible to stay in power everlastingly repressing own citizens. All autocratic and authoritarian rulers should be aware of the teachings of history which is mostly ruthless and hardnosed, otherwise the history will not exonerate.